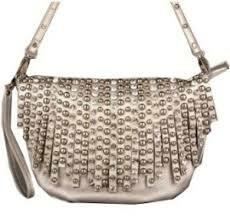 Beautifully done bag with cascading fringe with heavy weight studs in the Imoshion Maple Handbag. Soft rose color Studded strap can be removed and a wrist is included. Inside zip pocket and two interior cell phone pockets.